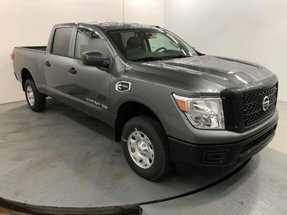 Description NAV, iPod/MP3 Input, Satellite Radio, Keyless Start, Bluetooth, Bed Liner, Alloy Wheels, [K03] PRO-4X UTILITY PACKAGE, Tow Hitch, Diesel, Back-Up Camera, Turbo, 4x4. GUN METALLIC exterior and Black interior, PRO-4X trim. Warranty 5 yrs/100k Miles - Drivetrain Warranty; READ MORE! Navigation, Back-Up Camera, Turbocharged, Diesel, Satellite Radio, iPod/MP3 Input, Bluetooth, Trailer Hitch, Keyless Start, Dual Zone A/C, Smart Device Integration, Blind Spot Monitor, Cross-Traffic Alert MP3 Player, 4x4, Aluminum Wheels, Keyless Entry, Privacy Glass. PRO-4X UTILITY PACKAGE Power Slide Rear Window w/Defogger, Front & Rear Parking Sensors, Fender Premium Audio w/12 Speakers, amplifier, underseat subwoofer, center speaker and front/rear tweeters, Electronic Locking Tailgate, Utilitrack System w/4 Tie-Down Cleats, Tailgate Area Illumination, LED Under Rail Bed Lighting, 110V Bed Outlet, Rear Utility Bed Step. Nissan PRO-4X with GUN METALLIC exterior and Black interior features a 8 Cylinder Engine with 310 HP at 3200 RPM*.